Hi so we found ourselves in a situation where one of our handlers was caught in an execution loop and ended being retried thousands of times, resulting in sending emails to the same person a couple thousand times. In Service Insights, you can see thousands of those messages (AccountCreatedNotification firing which causes a SendMail message). They obviously are the same message and look like they are part of the same flow. This functionally has been working correctly for more than a year. Funny part there is no failed messages logged anywhere, and these ones were successful. During this time we found thousands of storage exceptions entries in the nservicebus logs, which grew them to s huge size ( See Below end of this message.). 2019-03-24 23:34:08.762 WARN NServiceBus.AzureStorageQueues.ReceiveStrategy The error pipeline wasn’t able to handle the exception. Microsoft.WindowsAzure.Storage.StorageException: The remote server returned an error: (404) Not Found. —> System.Net.WebException: The remote server returned an error: (404) Not Found. ErrorMessage:The table specified does not exist. 2019-03-24 23:34:08.772 WARN NServiceBus.AzureStorageQueues.ReceiveStrategy The error pipeline wasn’t able to handle the exception. StatusMessage:The specified container does not exist. ErrorMessage:The specified container does not exist. 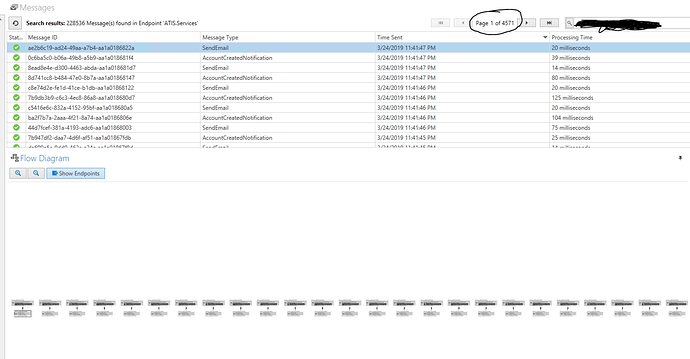 Quick review of the stack trace, it looks like the endpoint is failing to connect to the delayed messages table. Where any tables removed by any chance? Restarting endpoint would ensure the table is recreated. If that doesn’t help it’s better to handle this via support case (https://particular.net/support). PS: do you use both transports, NServiceBus.Azure.Transpots.WindowsAzureServiceBus and NServiceBus.Azure.Transports.WindowsAzureStorageQueues? Could it be a failure to connect to those tables? We are seeing storage exceptions in other cases which I am going to post in another thread? Hard to say w/o seeing handler code, endpoint configuration, and having more context. Hence the ask to route it via support to understand A) what’s happening B) how to reproduce it to fix in case it’s a bug.